The cool, dusty ring has an oval shape, with its long axis spanning about 35 light-years and its short axis about 25 light-years. Fallscheer and her colleagues estimate that the ring possesses the mass of 500 suns. Additional data from the James Clerk Maxwell Telescope, located at the Mauna Kea Observatory in Hawaii, further helped characterize the odd ovoid. 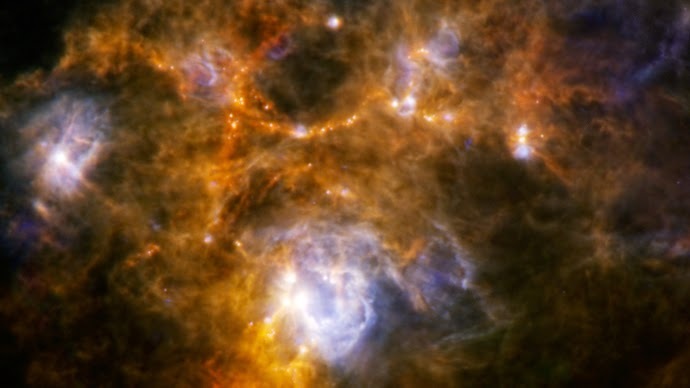 Astronomers often see ring and bubble-like structures in cosmic dust clouds. The strong winds cast out by the most massive stars, called O-type stars, can generate these expanding puffs, as can their explosive deaths as supernovas. But no energetic source or remnant of a deceased O-type star, such as a neutron star, is apparent within the center of this ring. It is possible that a big star blew the bubble and, because stars are all in motion, subsequently left the scene, escaping detection.